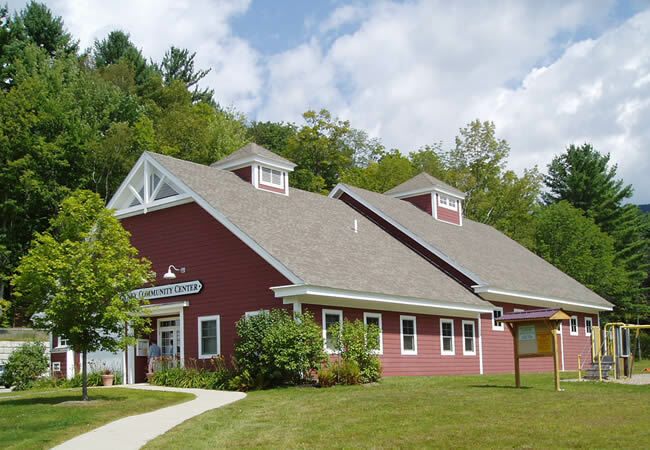 Our first commercial architecture project as a firm, located in lovely Jackson, NH, is the Whitney Community Center. This community center is the home for local community theater, group meetings, school programs and private parties. It also includes a commercial kitchen, a small conference room and an arts and crafts room for the neighboring Jackson Grammar School children. The 4,500 square foot building is built on a slab-on-grade foundation and is constructed of structural insulated panels and wood roof trusses. The exterior siding is cement board and the building is heated and cooled by exterior heat pumps. The performance stage in the main gathering space was made accessible by a gentle inclined slope that resembles a low wall from the audience. Whitney Foundation Trustee Ann Bennett made a flattering comment on our behalf: “Christina and Doug’s vision into a highly efficient, beautiful yet affordable structure was central to the project. They are versatile in state-of-the-art green construction techniques and completed the architectural phase of our project in an extremely tight time line.